During the past weeks, appalled Sri Lankans have been witnessing the local version of The Game of Thrones. The current constitutional crisis, in addition to provoking civic unrest and economic chaos, has also elicited much legal analysis in the media. Some have argued that such analyses are presumptuous because the Supreme Court will decide the issue and people should patiently await the authoritative decision by the Court. Others have decried these analyses on the ground that the doctrine of sub judice precludes discussion of these issues. Both these objections are misplaced. On a matter of constitutional importance, debate among citizens is both desirable and useful. In R (Miller) v Secretary of State for Exiting the European Union  UKSC 5 (the Brexit Case), Lord Neuberger, the President of the UK Supreme Court, thanked those who had analysed the decision of the Divisional Court on the dispute because it resulted in “more refined” arguments before the court. Likewise in Sri Lanka, the writings of distinguished scholars, such as Professor Suri Ratnapala on the proper interpretation of the 19th Amendment cannot but be useful to judges who will be called upon to adjudicate the issues posed by the crisis. With regard to the doctrine of sub judice, the objection misunderstands the operation of this principle. It applies only when the courts are hearing a case which could be a litigation among private parties or a criminal prosecution where the facts are in dispute. It does not preclude discussions on pure public law issues. Again, in English jurisprudence, from where we derived the doctrine of sub judice, the principle did not operate to prevent a detailed critiques of the Divisional Court Brexit judgment by scholars and the public when an appeal against it was pending in the Supreme Court. Indeed, a tabloid, without fear of being found in contempt of court, branded the judges who upheld the arguments made on behalf of Gina Miller as enemies of the people. 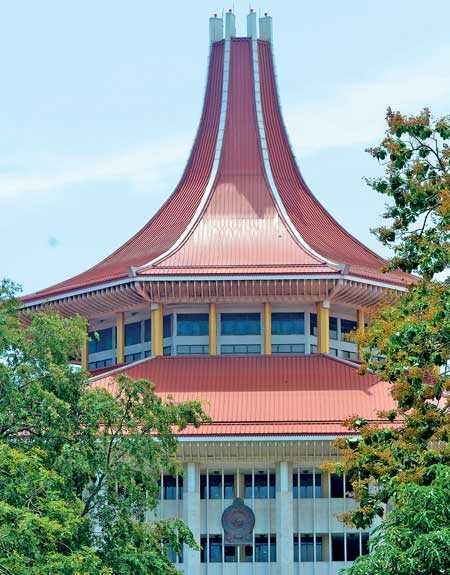 It is hard to remember a time in independent Sri Lanka where the country has been so polarised about the proper interpretation of a constitutional provision. Much of the discussion has espoused partisan viewpoints. Criticisms of viewpoints often have degenerated into ad hominem attacks on the contributor of the viewpoint. This is unfortunate because it discourages knowledgeable persons who can provide a disinterested analysis and contribute to the discussion from doing so because of concerns that their integrity might be impugned. A civic debate about the sweep of the 19th Amendment is essential. The controversy, as most people know, is about two articles in the 19th Amendment that appear to contradict each other. For the reasons given below, it is submitted that in an exceptional factual situation where certain conditions prevail, where Article 70 conflicts with Article 33(2)(c), the former article must give way to the powers of the president in Article 33(2)(c). What is interesting was that Jayewardene was not claiming the power of a modern monarch – the UK Queen or any other monarch in democracies had no pretensions on this score. Jayewardene was either claiming the jus vitae nequisque power of history’s brutal dictators such as Caligula, Stalin, Pol Pot or the “Emperor” Bokassa or he was stating that he, the executive, was empowered to the same extent as the Westminster Parliament, operating under an unwritten constitution in the world that uniquely grants absolute unfettered power to a legislature. Leaving aside the hubris of the claim which was probably made ironically, it could be argued that he was rightly claiming that the president, being the single individual, elected by the people of the country, was the sole and authentic delegate of the true sovereign of Sri Lanka, the people who, as it has been an ad nauseam repeated incantation, own the sovereignty of the nation. Indeed, if newspaper reports are to be believed, some successors of Jayewardene believed that the jus vitae nequisque was a part of the portfolio of presidential powers and had no qualms about deploying such power. In the two constitutions prior to the 1978 Constitution, the ‘Soulbury Constitution’ which granted dominion status to the country with the governor general representing the British Monarch and the First Republican Constitution of 1971 with the president replacing the governor-general but essentially inheriting the powers of the latter, circumscribed as they were with conventions which required the head of state to act in accordance with the advice of the prime minister who was the chief executive of the country, the head of state was a titular figure like the British monarch. The Second Republican Constitution changed all that. No longer was the head of state, a nominal figure, but was empowered to be an all-powerful executive president. Unlike prime ministers until then he was no longer primus inter pares. He or she could not, like the Sun King, declare l’état est moi but could come pretty close because sovereignty resided in the people and he/she was the single individual who had obtained a mandate from the people as a whole. This was an awesome power to be exercised with responsibility. Lord Acton’s famous aphorism about the corrupting effects of powers has been modified by social science theorists. Power, it has been found, corrupts only when exercised with no balancing consideration of accountability but corrupts where there is no acknowledgement of accountability. Instances of the former are rare, Singapore being a good example, but instances of the latter are legion where one does not even have to look beyond the shores of the island for egregious examples of the abuse of executive and judicial power. In examining the current controversy over the proper modalities of calling a country-wide election, some context derived from comparative constitutional arrangements is useful. The constitutions of democracies broadly provide for three models regarding the timing of elections. At one end is the American constitution that provides for periodic elections inflexibly pre-determined by the calendar: four years for a president, two years for the House of Representatives, and six years for a section of the Senate. Accordingly, a sitting president seeking re-election is forced to contest in the month of November in a presidential election even though the economy is bad at that time but will improve in the following February. At the other extreme, is where elections may be called when the head of state on the advice of the prime minister dissolves Parliament and calls for fresh elections. The weakness of this model is that the dissolution may be strategic with the prime minister advising a dissolution when an economy is good but would decline at some time in the future. The threat of dissolution could also keep recalcitrant MPs in line. Constitutional conventions, for example the defeat of a throne speech or a successful no-confidence motion, may also require the dissolution of Parliament. The middle path is where only specified circumstances would require the dissolution of Parliament. The Westminster Parliament moved from the extreme where dissolution was largely in the hands of prime minister to the current situation where dissolution takes place only in limited circumstances taking the decision out of the hands of the prime minister. This was done by the Fixed Term Parliament Act of 2011 which fixed a term for the UK Parliament. Section 2 provided for an earlier dissolution if there was a no confidence motion against the government that was sustained or if two-thirds of the members of the House of Commons voted for an earlier dissolution. If one argues that Article 33(2) enlarges the powers, restricted under Article 70(1), the curious reading is that that by adding to the power, the process also involves reducing the duties so clearly imposed by Article 70(1). This cannot be so. Powers can be added to only if there is no corresponding reduction of duties. The solution advanced to this conundrum by some theorists is argue that a general constitutional provision must give way to a specific provision that addresses the issue of dissolution of Parliament. This may be so if the specific provision qualifies in some way the general provision. But it cannot be correct where the specific provision in effect erases the general provision off the statute. The position in order to be sustained would require reading into Article 33, a phrase akin to Section 29(1) of the Soulbury Constitution, which would be inserting after “the President shall have the power” the phrase “subject to Article 70(1) hereof”. Even if that were so, the point of section 33(2) (c) would be baffling. When the 19th Amendment was debated, members of Parliament included a law professor and several lawyers. The Supreme Court examined the draft text of the 19th Amendment. The discrepancy between Article 70(1) and Article 33(2) was not addressed. In other words, these provisions were regarded as internally consistent. The assertion that the detailed provision of Article 70(1) supersedes and renders nugatory Article 33(2) (c) flies in the face of constitutional theory which holds that a constitution does not contain meaningless provision. It will be a grave usurpation of judicial power for a court to declare that Article 32(2) (c), an extant part of the constitution, is nonsense. Especially, since the apex court heard detailed submissions and green-lighted the provisions under review, this Article must be considered operative. Moreover, if one concedes that there are no dead letter provisions in the 19th Amendment, then it is incumbent on the proponents of the view that Article 70(1) overrides Article 33(2) (c) to provide instances where Article 33(2)(c) could be legitimately used by the president to dissolve Parliament. This, they have spectacularly failed to do. To resolve this inconsistency, it is submitted that citizens, and the Supreme Court, would have to look at and assess the significance of the larger constitutional principles in play. Einstein is reported to have said that we cannot solve our problems with the same thinking we used when we created them. A reading of the micro provisions like a Talmudic scholar would be like a debate about how many angels can dance on the head of a pin. Recourse should be had and the solution must be found in broad constitutional principles that are appropriate to the Sri Lankan people. First, under the Constitution, sovereignty is vested in the people of Sri Lanka. Second, because the direct exercise of that sovereignty is not feasible, sovereignty is exercised through the various organs of state specified in the Constitution. Third, the delegation of such powers is not absolute as shown in the chapter on Fundamental Rights. Powers of all organs of state are of a fiduciary character and must be exercised for their proper purpose. Fourth, ascertaining the will of the people is desirable and a public good. The President may call for a presidential election without waiting till the end of his term and the Constitution provides for referenda whereby the wishes of the people could be ascertained. Fifth, Article 70(1) abolished the pre-19th Amendment right of the people to be consulted in a General Election that follows a dissolution of Parliament after a short period. The four-and-one-half-year limit imposes a fetter of an existing right of the people who were denied the opportunity to approve such a fetter in a referendum. Article 70(1), on the other hand, does not curb a prerogative power by shifting the balance of power between the crown/executive and Parliament as has been done several times in the UK, but instead clogs the power of the people to be consulted when the president, who is the single person elected by the people as a whole, is prevented from doing so. Accordingly, these principle of the sovereignty vested in the people is of such overwhelming importance that it dictates that in a conflict, Article 33(c) overrides Article 70(1) especially since the latter has not been approved in a referendum. The issue then arises as to the circumstances where Article 33(c) (2) could properly be used. Bearing in mind the fact that in Sri Lanka, the people are sovereign, that fact may be what the books call the grundnorm of the Constitution. Under what circumstances would strict adherence to Article 70(1) conflict with this grundnorm? It would, it is submitted, when a state of chaos and political instability threaten to shake the very foundations of the Sri Lankan state, questions relating to such chaos must be referred to the supreme arbiter of the Sri Lankan state, the people who are sovereign, by the temporary agents of that arbiter. If in a company, management fight each other leading to a plunge in stock value, the shareholders, as ultimate owners, will be decide by firing the entire board of directors. Why should the fact that the present contest is between the President and the Prime Minister and not in a company produce a different outcome? With the rupee plunging through the floor, scenes in Parliament bringing shame to the country, and the people taking a severe battering in the form of economic hardship while their elected representatives, engorged on subsidised meals, enjoy the comfort of duty free luxury vehicles and other perks, it would be futile to deny that the threshold required for the activation of Article 33(2) (c) has not been passed. True, the chaos might have been triggered by an irresponsible and malicious act of the President, but this is conduct to be punished, rewarded, or overlooked by the people in an election. Finally, a principle of contract interpretation may be useful. The President often boasted that he willingly consented to a reduction of his privileges. If the 19th Amendment is regarded as a compact between Parliament and the President, then the contra proforentem rule would dictate that ambiguities should be read against the party responsible for the drafting which in this case was Parliament. Parliament had an opportunity to avoid ambiguities in interpretation. It failed to do so. It should accept the consequences. In the seminal case of Marbury v Madison, Marshall CJ stated that “It is emphatically the province and duty of the judicial department to say what the law is...” Most judges through the ages in Sri Lanka and elsewhere, with a few infamous exceptions, have discharged this duty with honour and earned the trust of the Sri Lankan people for most periods. The people of Sri Lanka, whatever their political stripe, should be grateful to the courts in Sri Lanka that will once again be called upon, in the language of the Magna Carta, to pronounce on the interpretation of the 19th Amendment “without fear or favour, affection or ill will” and will do so in an opinion that will make all Sri Lankans proud of the quality of their Judiciary.